Searching for water located below the earth’s surface, in phreatic layers or aquifers, in order to pump it. This is done with the utmost care and precision, using appropriate techniques, in order to dig or drill wells in the best possible places and thereby avoid costly, discouraging failures. Around 1250 BC, Moses searched for water in the Sinai desert using his divining rod, practicing an art known since early Antiquity. However, the modern techniques stem from the 20th century. This method is mainly used in developing countries or other regions where water is rare and where irrigation is essential for crops. It is also used in developed countries but mainly for uses other than direct consumption (gardening, geothermal energy). Given the growing and vital importance of water and soil resources around the world, as well as their scarcity, we need to do everything possible to improve the finding, management and preservation of these essential and fragile resources. Groundwater is usually good-quality water. As it is often buried at significant depths, it is highly advisable to locate it as precisely as possible and assess its quantity and quality before undertaking costly drilling work and thus avoid costly failures. This water can be detected with more or less precision depending on the methods used, through the electromagnetic waves it emits. This method primarily concerns underprivileged rural or peri-urban areas. In mountain areas, this method is difficult to implement due to the great depths involved. It particularly concerns regions prone to severe droughts. Indeed, aquifers are natural underground reservoirs capable of supplying large quantities of drinking water during the dry season, when rivers are likely to dry up. 5) What does this process involve ? How is it implemented ? In actual fact, it consists of different methods ranging from the most rudimentary – but nevertheless of interest for people or small communities with little means, such as dowsing – to the most sophisticated such as the prior analysis of satellite photos or proton magnetic resonance (PMR) investigations. The purpose of this document is not to give detailed explanations of the mode of operation and use of the various techniques, as most of them are fairly costly and can only be used by specialists. Instead, it aims to explain the principle and main advantages and drawbacks of the techniques, so that the communities and people concerned can find out about their main characteristics and be able to contact specialised companies, having gained better knowledge of the facts. The search for groundwater sources must take account of technical (hydrogeological) criteria as well as socio-economic criteria (closeness to a village, cost of investigation). In actual fact, closeness to the beneficiaries often remains the prime criterion. There are various methods for investigating phreatic layers. 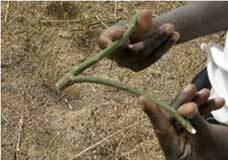 Traditionally, dowsing was the only way of searching for groundwater. Subsequently, more modern and scientific techniques were developed, significantly improving the success rate of water collection facilities. It is highly advisable for phreatic layer investigators, especially if they are not from the region concerned, to carry out preliminary surveys in order to collect information which can give them precious data on the places where there is a likelihood of finding water. - after a first look at the site and a meeting with the chiefs or heads of the villages, a survey with their population to find out where wells would have been dug or where springs would have been used, where the vegetation is greenest and remains green during the dry season, where trees and plants naturally grow best, where the existing water sources have the highest outflow in all seasons, where the termite mounds are located, if any, etc. - or, at the same time, research into the region’s geological map, climatic data and all appropriate information which may be obtained from the local or regional authorities or other organisations or operators working in the region. 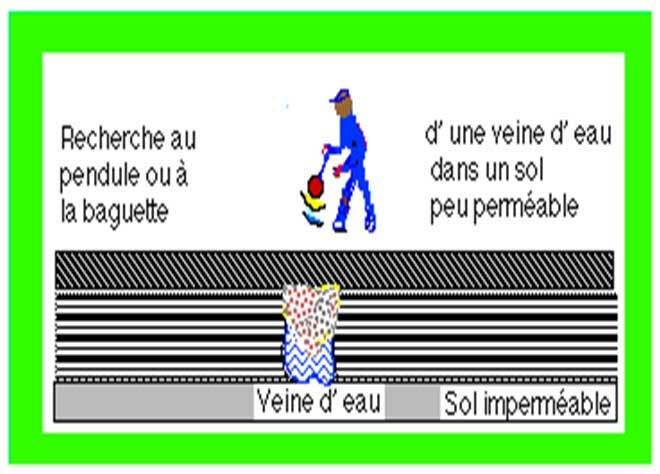 In numerous countries (including France), certain people have the ability to investigate and determine the presence of water on a site and detect water channels (veins, faults and aquifers). These "dowsers" are often people who have special abilities passed down by their predecessors or a village wise man or woman. - Positioning the twig or rods between the fingers so as to amplify the sensations felt and seeing if they twitch and go down (or cross) at the expected place. - Criss-crossing the area in order to determine the most promising areas. When the dowser uses metal rods, he holds them parallel between his fingers. When he comes close to a place under which there is water, the rods get closer together and end up crossing over one another where a groundwater source is significant. This can be tested and proves successful with many people, but the findings are imprecise and do not indicate the size of the aquifer. Moreover, this method doesn’t make it possible to detect small, relatively deep groundwater flows. These methods make it possible to locate aquifers with more precision, and they are much more efficient in assessing their size, volume, quality and sustainability. Analysing maps and local vegetation gives a first indication of the presence of water. In the case of large-scale investigations, a global geological analysis can even be carried out through the interpretation of satellite images or aerial photos. These can highlight the presence of the major geological outlines liable to give rise to fractures with an identifiable direction or outcrops. 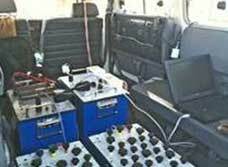 Geophysical methods are now the main methods of investigation and detection of underground aquifers. The method chosen mainly depends on the geological context. With these methods, we strive to study the soil’s physical properties and in particular its electrical properties. The aquifers are most often trapped between rock layers. All rocks conduct a certain amount of electricity, but their conductivity and resistivity vary according to their type : compact rock, dry rock, fractured rock, wet rock, permeable structures or impermeable ones. 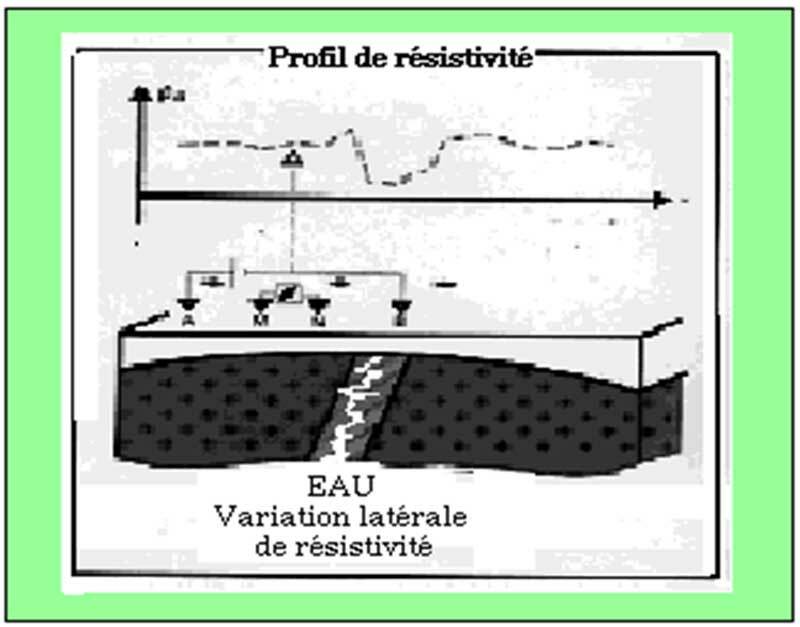 A material’s electrical resistivity is its capacity to oppose the flow of electric current. 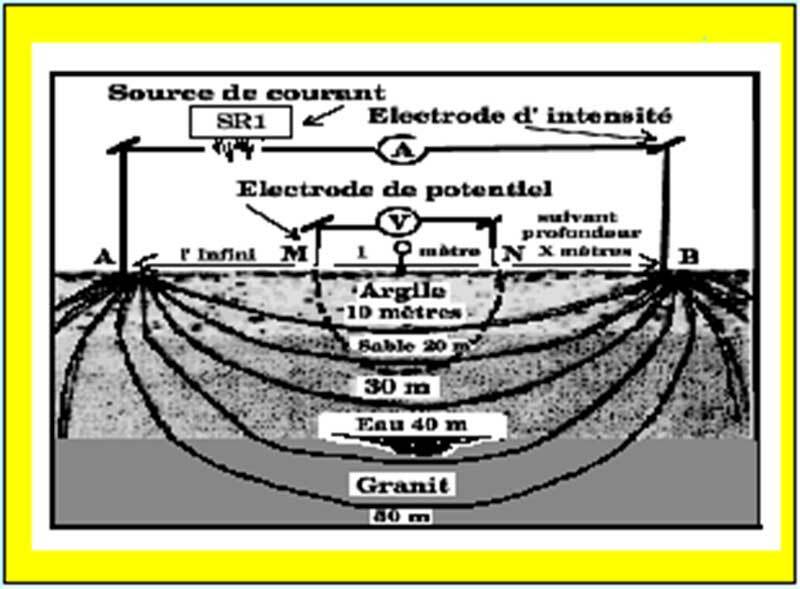 These methods are thus based on the capacity of the soil or rock to conduct electricity and the measurement of their conductivity or resistivity (the opposite of conductivity). From these measurements, the type, size and quality of the aquifer is deduced and specified, or perhaps only presumed, but with a high probability. Easier to implement, such as the Slingram and VLF methods, these methods measure electromagnetic signals due to magnetic induction phenomena. They don’t need any contact with the ground and thus no electrodes. 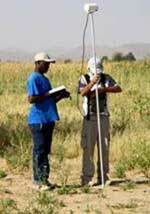 They make it possible to measure the soil’s reactivity to electromagnetic excitation. However, they cannot be used on all types of grounds or for aquifers over 20 metres deep, or even less. Their use seems to have dwindled. This is a direct water detection method. It consists in sending electric currents into the ground, then measuring the signals emitted by the nuclei of hydrogen atoms in water molecules. It requires sophisticated equipment including proton magnetometers which can measure electromagnetic fields ; their recordings can be interpreted on site and, most importantly, the quantity of groundwater present in the rock can be deduced in a few seconds. 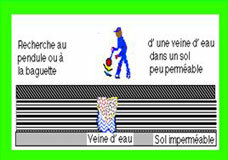 This method is mainly useful for tracing the water flow and to estimate the age of the groundwater. We know that the phreatic layer is renewed by the infiltration of water through the inflow area, where the aquifer’s geological structure is exposed to the surface. Investigations using the isotope method can often give useful indications. If there are infiltrations, they can be detected and assessed by analysing the variations in the isotope content of the damp soil above the phreatic layer. The most used isotopes are tritium, deuterium, oxygen 18 and carbon 14. The results have shown that this method is reliable and promising, in particular if it is used with the physical models describing the water flow. - Dowsers can never guarantee the presence of water, nor its depth, quantity or quality, as their approach is solely sensory. Moreover, it can be distorted by various factors (lack of concentration, presence of an electric current). 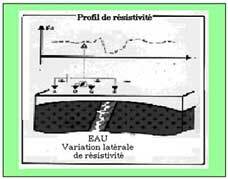 To optimise the investigation of aquifers, additional information and measurements are thus required. - To avoid considerable risks, it is indispensable to call on the services of hydrogeophysics experts for major drilling work. Indeed, it is essential to have highly sophisticated equipment and to know how to maintain it, and to have solid knowledge and experience. These methods sometimes avoid serious or costly errors in groundwater investigation and save both time and money. Preliminary on-site surveys and dowsing provide interesting indications at a very low cost when little means are available. The methods based on electrical resistivity and conductivity are much more precise and offer great spatial measurement density, which will allow relatively detailed exploration. They make it possible to detect indirect signs of the presence of water. The PMR method is an innovative, rapid method for the direct detection of the presence of water. Its use is expanding. Most of the time, operations based solely on a dowser’s findings do not bear fruit or the findings are too imprecise. What’s more, the effectiveness of a type of operation is difficult to assess since situations are rarely comparable. Moreover, the use of this equipment presents drawbacks : it only allows detection down to a certain depth and the indications may be distorted by the presence of electromagnetic signals or electric lines. Modern hydrogeophysics techniques are costly. They can only be used for the set-up of large or numerous water extraction facilities for which large budgets are available. Often, investigations for large aquifers in southern countries are financed through the United Nations Development Programme and the World Bank. A preliminary survey must make it possible to assess the value of the information to be obtained (i.e. their usefulness and cost). While the cost of a dowser is low (a few tens of euros), the cost of using modern methods is much higher and depends on the situations encountered and the methods used. It always amounts to several tens of thousands of euros. Dowsers’ rates vary according to countries, the dowser’s experience and travel expenses. For instance, the dowsers of Dapaong in Togo charge between €80 and €160 for their services. The cost of machines which take hydrogeophysical measurements depends on the size of the machine, maintenance costs and training costs. These costs are difficult to assess with precision as their is little information on the remuneration of aquifer investigation specialists, on the method(s) they use and on the type of area studied. Other costs include the transportation of equipment to the sites and accommodation and meals for the team of technicians. It is generally accepted that the search for a drilling site should not exceed 20% of the cost of the drilling operation itself. In Chad, over 300,000 refugees from neighbouring countries have settled in the east of the country, where water was already in very short supply. In order to find new water resources, several NGOs including OXFAM and UNHCR (UN Refugee Agency) have been working in partnership with Iris Instruments, a French company which manufactures equipment and provides training. 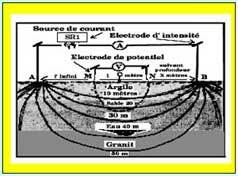 The main method used has been that of magnetic resonance imaging : by sending electric currents into the ground, it makes it possible to detect hydrogen atoms and determine the quantity of water present in the rock, provided the water is less than 150 m deep, which was the case in Chad. Several aquifers were thus found around Iriba. A complete magnetic resonance kit weighs around 350 Kg and costs about €140,000. Daily motion : Short video (2 min) on how to find a water source, showing how a dowser can find groundwater using simple rods. - Action Contre la Faim : "Eau - Assainissement – Hygiène pour les populations à risques"
Comprehensive 745-page book published by Hermann 6 rue de la Sorbonne 75 006 Paris (€50) explaining and illustrating the various methods used by ACF to provide access to water and sanitation ; pages 131 to 173 focus on the search for aquifers, a topic which is well covered with detailed explanations and numerous examples and illustrations of the various existing methods. 146-page book published by FAO/BRGM, in the collection Manuels et Méthodes, n°28, Orléans, France. It explains the need to adopt a prospective approach in order to avoid water crises. 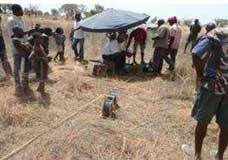 I am trying to find an underground water point for my agricultural land. Can you please help me out. i will new methods investigation my own scientific methods fallow with identify ground water techniques.but sponsor and support me. Yes, you can get certain water location with satellite equipments (ask Google) but is is too expensive for small communities or people with few ressources. Hi.. the rescuers in Thailand are digging into the ground above the site where the trapped children and adult are. Is there an effective method to locate them from the forest?